Plinto has been revised in a new form marked out by containers and open spaces, integrated into one element. 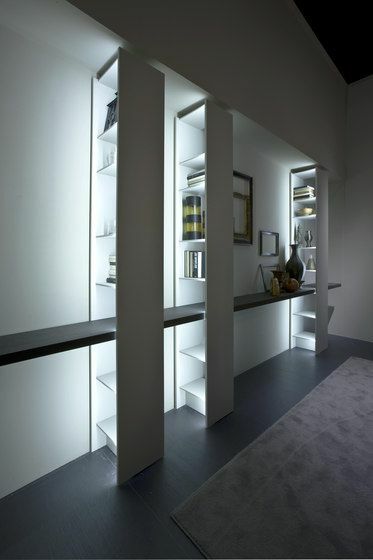 Other components, featured by open spaces hidden by the cabinet structure, frame in the composition a vertical architectural stroke, visually very impressive. Its modular structure has been improved and made more flexible by adding a 16 cm module (1.6), allowing for both more articulated solutions and the total integration with the APP (Architectural Partition Project) wardrobe system, which can be used to divide living spaces architecturally.